This Total Boston tour combines three of our most popular group tours — North End Food Tour, From Food to Freedom Trail and Bowling, Bites & A Boat Ride — to give you one perfect day out! 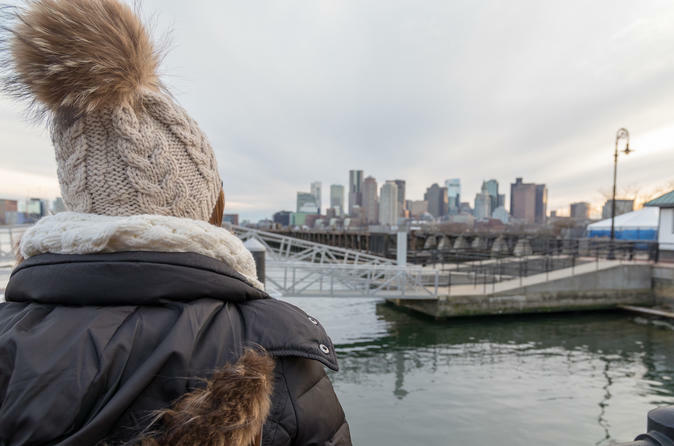 Your adventure begins at Boston Harbor. From here we’ll make our way to the heart of the North End, admiring historic sites and properties in the neighborhood as we go. Next, your guide will introduce you to a small, hidden Italian bakery serving up fresh bread daily, then a proper Italian salumeria, where you’ll taste Italian meats and cheeses. We’ll grab a hot drink on Hanover Street then head to the Old North Church. After taking a look inside the Church, we’ll grab a slice of our favorite pizza and sample some of the best Italian pastries. Yum! Rest your legs before heading to the historic Custom House Tower, the city’s first skyscraper. We’ll take a quick peek inside, then we’ll visit the famous Faneuil Hall and Quincy Market. In the heart of Downtown Boston, we’ll stop in front of the Old State House, site of the Boston Massacre, then on to one of the most historic places in the country, King’s Chapel. Somewhere along the way during this tour, you’ll have a chance to rest your legs and enjoy a refreshing local beer. We’ll continue through Beacon Hill, where you can take in the quintessential architecture of Boston’s red brick row houses. A great photo opportunity! We’ll arrive at the beautiful Boston Public Garden, one of the city’s favorite green spaces, where you’ll see locals walking the dogs, playing with their kids and enjoying lunch in the shade. After a short walk or ride back to Long Wharf, we’re going underground to the Blue Line T Station, to the oldest subway tunnel in the country, dating all the way back to 1904. Next, you’ll enjoy the local scene at Bremen Street Park. As we walk, you’ll see shops and restaurants reflecting the diversity of East Boston’s residents.Then it’s time for bowling Boston-style! You’ll have the option to pick up a beverage, as you’re encouraged to BYOB. If bowling isn’t available, we’ll head to a billiard hall to play a game of pool together with the locals. The evening continues as you walk down Meridian Street, taking in murals depicting the history and influence of immigration in East Boston. We’ll continue to Maverick Square, where we’ll enjoy a snack along the way. Next, we head to the waterfront for stunning views of the skyline and, at certain times of the year, you’ll have a chance to catch an amazing sunset. If time allows, we’ll take a look at the Boston Shipyard. Here you’ll see some creative public art and get a chance to visit a local cider house for a tasting. Finally, we’ll call the water taxi to bring us back across the harbor. From the boat, your guide will point out the must-see neighborhoods and landmarks that make Boston special.